With the cold chill in the air, one fact is abundantly clear: the holidays are just around the corner. Yes, soon lights will cover every home, presents will be under every tree and the sweet smell of gingerbread will drift through the air. It’s the season of giving, and for the business professional or marketer, this means it’s time to give to your customers. There are lots of reasons to give back to customers or clients during the holiday season. Not only does receiving a gift remind your customers about the business, but it also builds a personal relationship and shows them you truly care. Gift-giving establishes a deeper bond between the business and the client, and encourages the customer to keep coming back for future purchases. However, if you give the wrong gift, you might end up having the opposite effect on clients. 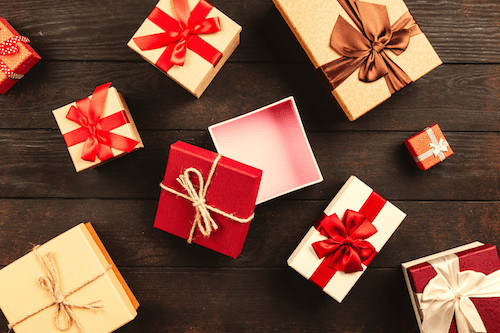 To help you pick out the perfect presents for clients, we created a quick list of holiday gift ideas you can give every type of customer this season. One of the most valuable things to give customers this holiday season is the gift of personalization. Show customers how much they matter by offering up a handwritten note. Take time to sit down and wish the client a happy holiday season, ask questions and even share personal updates. Remember to make things relatable by using the client’s first name, purchasing history and incorporating authentic writing. A genuine note of goodwill and gratitude can go a long way in boosting client relationships. Of course, what do people love just as much as handwritten notes? Food! If you want to get clients something small, but still fun and enjoyable, nothing beats a gift basket. Send an edible gift basket filled with chocolate, fruit and other holiday goodies for the client to enjoy with others around the office. What’s even better? As the basket of goodies is passed around the office, customers will inevitably talk amongst themselves and share about the incredible company they did business with, who sent them the basket. As you decide on what to get clients this holiday season, don’t forget about the classic—and effective—office supplies. While office supplies might seem overdone at times, nothing beats their usefulness and practicality. Consider gifts the customer might use every day, such as a personalized pen, notebook, tech gadget or tote bag. If it has your business logo on it, even better! Then the customer can enjoy their new office gift, and still market for your company throughout the entire year. If you want to meet in the middle between fun and practical, consider buying educational books for the customer. If you have a favorite industry-relevant, business-related or inspiring-leadership book, why not send a copy to the customer? This way, not only do your customers receive something practical and useful, but they can also enjoy learning from the material you send. Personalize the gift by writing a little note on the inside cover, so they always remember where it came from. Finally, nothing beats a great holiday discount. This present is useful because it often saves you time and energy, but is still appreciated by the customer. Send clients a note and offer them a discount for the holiday season to thank them for their continued support. Or, if you want to avoid the potentially “self-serving” image, send clients a free product to try, instead. Whichever you decide, a discount is a great holiday gift option which benefits both you and the customer. If you’re a business professional or marketer, now is the perfect time to embrace the season of giving and give back to customers. Keep these ideas in mind as you decide on the perfect holiday gift. Who knows? You may just find that the more you give, the more you grow.